Hey true believers-er, I mean, Bif Bang Pow-ers, Jason Lenzi coming at you with some more out of this world news (see what I did there?). Our boys, Mr. Gordon and Mr. Merciless, have gone and done it: they've made it onto a list of their own. Obviously a little tired and a fair bit jealous of all the press Lebowski and Sobchack have been getting of late, they've headed on over to the offices of Sci Fi Magazine and made their presence known. 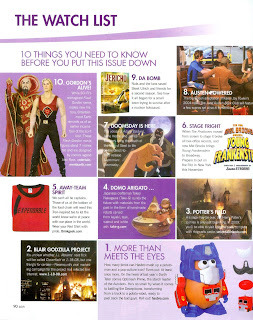 Yes folks, the warm vibes of the BBP train keep rolling through the ether, 'cause in the brand new October issue of Sci Fi Magazine (the official publication of the Sci Fi Channel, don't cha know) Flash and Ming action figures have placed in the top ten of their monthly Watch List. And look who we're rubbing shoulders with: JJ Abrams, Optimash Prime and Supes himself. Once again, we find ourselves in esteemed company, and we couldn't be more proud. Until, of course, all of YOU get your sets of Flash and Ming, when we'll really know we've made it! Run out and grab a copy of the ish when ya can, it's a super cool mag and always has plenty of hip stuff to put on your radar. Like cool new action figures, for example. 'Nuff said.